Last Monday I started 80 Day Obsession, so I have been meal planning like crazy! You would not BELIEVE how much food you get on this program — really! There is no food deprivation going on in the Leach House. My husband is “complaining” that it’s too much food. HAHAHA! Is there really such a problem? However, in doing this program, it requires more meal planning and prepping as it is all based on timed-nutrition, balancing out your macros, and having workout food “blocks.” All of things things help you maximize how you use food as fuel and really allow you to be most effective and strong in your workouts. As a result of the new nutrition plan, it’s really pushed me to become more creative with meal ideas, change up our dinners and try new recipes! Does anyone else love Caprese salad? 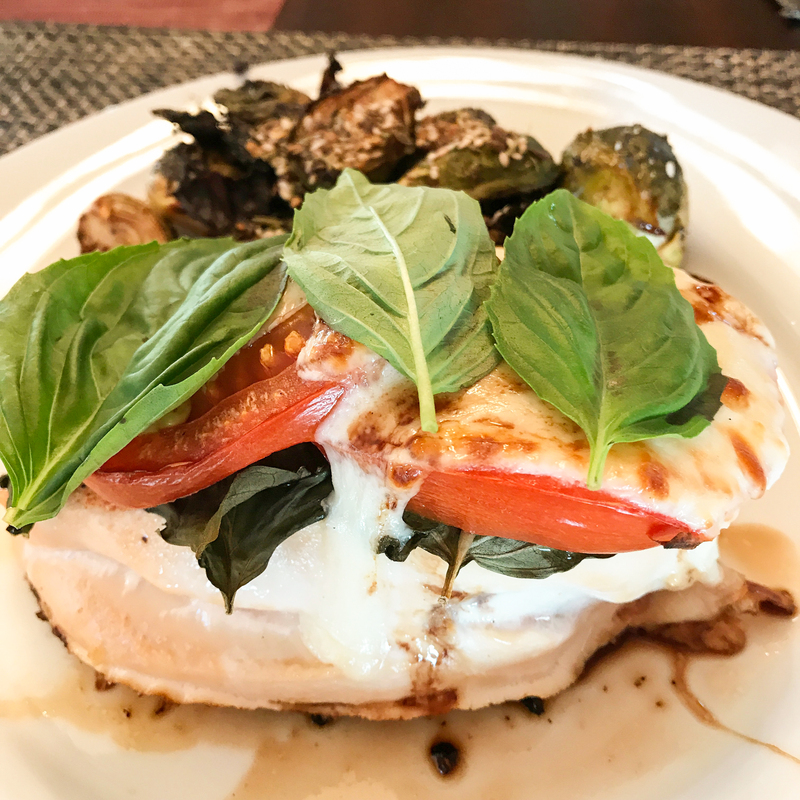 Wait until you try this Caprese Chicken recipe. Despite the fact that Spring has “arrived,” it still feels a bit dreary with our rainy days in Washington. But I’m moving away from the Crockpot (even though those winter stews and soups have been amazing!) and starting to become hopeful that we can have more meals that can be cooked on the grill! I hadn’t made this recipe in a long time and when we have done it before, we did it on the grill. However, it was a dark and rainy night when we made this, so we decided to try it in the oven! Surprisingly, preparing it in the oven made it that much better — the cheese melted so much more nicely! I had shared this one my Facebook Page, and as so many of you asked for the recipe and said how much you love Caprese, I decided to write up a short blog to share it! If you try the recipe, please make sure you come back and let me know how it goes. 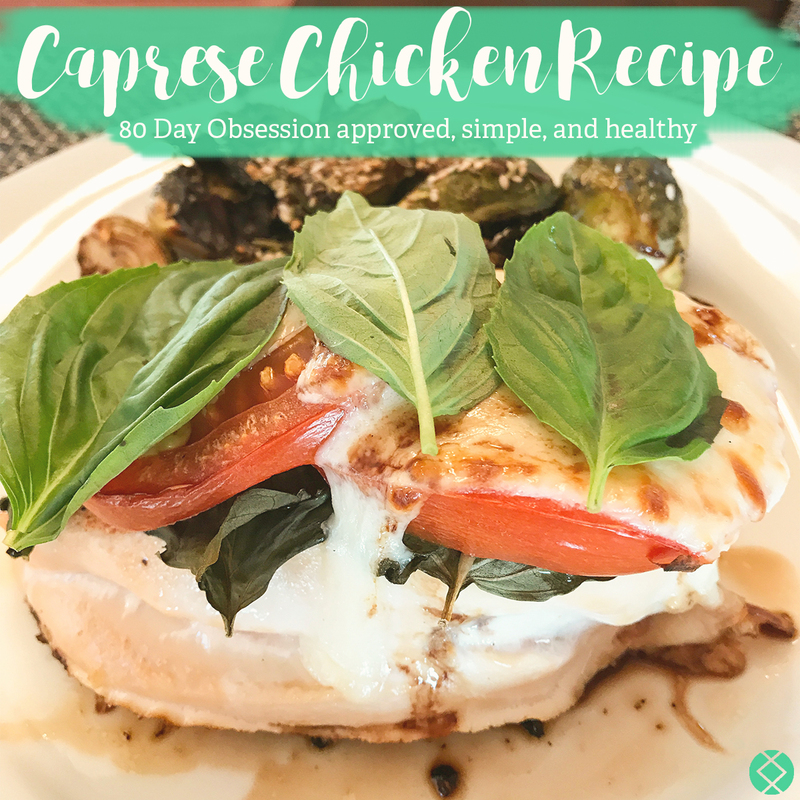 A healthy and simple 21 Day Fix and 80 Day Obsession approved chicken caprese recipe! Season both sides of chicken with salt, pepper, and a little garlic powder. Spray a glass dish with coconut oil cooking spray, place seasoned chicken breast in dish. Remove chicken from oven and top with tomato slices and basil followed by the mozzarella slices, and drizzle with balsamic vinegar. Return chicken to oven and bake for approximately 10 more minutes, until chicken is cooked and cheese is melted. Top with fresh basil and another drizzle of balsamic, serve and enjoy!